Aqua is a refreshing color tied into spiritual energy, tranquility, joy, and emotional balance. Those who identify with this color are patient, sophisticated, and creative beings. Black is a timeless color associated with strength, luxury, power, and authority. Those who favor this color have an air of mystery to them, but at the same time are confident. They enjoy the elegant things in life. Peace, wisdom, mysteriousness, grandeur, creativity, and magic are represented by the color purple. Those who identify with this color have great passion, and value spirituality and higher self. Freedom, imagination, loyalty, intelligence, and sincerity are associated with the color blue. Those who identify with this color are cool trustworthy individuals who have a calmness and wisdom to them. Green is a color that relaxes the mind and signals rebirth or new beginnings. It is the color of nature, life and energy. Those who gravitate towards this color are highly ambitious and value and respect their natural surroundings. Yellow is the color of sunshine and happiness. Positivity, enlightenment and joy are often associated with this color. Those who identify with yellow tend to be warm, spontaneous people with a positive outlook on life. Orange is a vibrant color signifying change. It is also associated with fun, enthusiasm, and boldness. Those who identify with orange seek excitement and stimulation, value the freedom of expression, and are compassionate souls. Red is an assertive color and associated with a broad spectrum of traits ranging from impulsive, daring, and determined to passionate, romantic, and energetic. Those who are fond of red are natural born leaders and intense individuals at times. Romance, charm, sweet, and feminine are traits associated with the color pink. Those who identify with this color are kind, loving, and nurturing individuals who are romantics at heart. The color white is the purest of colors and stands for innocence, spirituality, goodness, cleanliness, and humility. Those who identify with this color value sincerity, simplicity, and purity. Grey is a solid and stable color that creates composure and balance between the extremes of black and white. Those who identify with the color grey are mature individuals who are dependable and practical. Mint is the color of freshness, renewal, and youthful energy. Those who favor this color are hopeful and optimistic beings who strive for a balanced and peaceful lifestyle. Lavender is often used to show that something is special or unique. It is a color that symbolizes purity, devotion, and love. Those who favor lavender are said to be refined, elegant and graceful. Baby blue is a color that represents health, healing, and understanding. Those who identify with this particular shade of blue are usually gentle souls that favor tranquility and do not like to make a big deal out of things or attract attention. 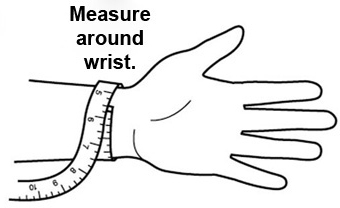 Measure the circumference of your wrist with measuring tape. If your measurement is below 6.5 inches, choose the small size. If your measurement is 6.5 inches or more, choose the large size. As a general guideline, our small size is designed for average female wrists/smaller wrists and large size is designed for average male wrists/larger wrists. Not sure? You can always exchange your bracelet for a proper size if it does not fit you. Kandi In Public bracelets are premium kandi bracelets meant for everyday wear. Wear an inspiring message. When you meet someone who could use the message more than you, pass it on to them! Each bracelet comes with a unique ID code that allows you to write and read stories of when and why the bracelet was passed on. Over time, you will be able to see the complete history of your kandi bracelet and the inspiring messages people have written to each other as the bracelet travels from wrist to wrist. 5% of proceeds from each bracelet goes to a designated charity associated with the bracelet's message. The Message: Life can be tough at times. We don’t get what we want, plans fall through, people don’t live up to your expectations. However, know that the sun will come out after the clouds have cleared away. Wear this message to be reminded there’s hope things work out for you in the end. Then pass it on to someone who’s at a low point in their life. The Color: The color white is the purest of colors and stands for innocence, spirituality, goodness, cleanliness, and humility. Those who identify with this color value sincerity, simplicity, and purity. The Cause: Reach Out WorldWide is a network of committed professionals with first responder skill-set founded by late actor Paul Walker. The volunteers provide their expertise when disasters strike and augment local resources with the goal of accelerating relief efforts on a worldwide basis. ROWW operates on the philosophy that by making a difference in just one person's life, the world has been changed for the better.